The #1 question people ask me is “Does P90X really work?” I could just say Yes and move on, but I know they are looking for more than that. 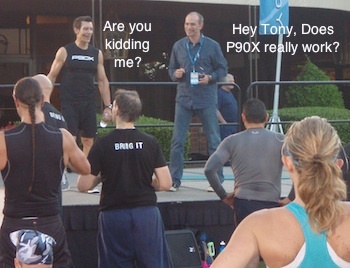 So here are my top 10 reasons why P90X works. Most people think P90X is one workout you do every day in which its not. You do 12 different workouts on different days over a 90 day period. Hence, a program. It keeps you on a schedule so there is no guessing on what to do. If you are like me and have the motivation to get to the gym but become bored with doing the same stuff over and over then the variety of P90X will keep you going. Most people stop going to the gym because they don’t see results and don’t know how to make up a good workout program. P90X covers this and it gets you out of your comfort box. The first time I did Plyometrics and Yoga X I was very surprised with how challenging they both were (I was sore for 3 days). Now, they are some of my favorite workouts. “The hard is what makes baseball great.” – Tom Hanks in a League of Their Own. That might have been a cheesy movie reference but I like it. P90X is hard. I do not care if you are already in shape or 100 pounds over weight, it will be hard for you. That’s why people are getting such great results. Its going to take more than 90 days for people who are overweight to hit their ideal weight as they have more work for them. What’s interesting is people who are in shape tend to achieve their best level of fitness ever when they complete P90X. You will get to the point when you look forward to your next P90X workout because you want to do more push ups / pull ups then you did last week. From there it becomes a addiction. If you follow the P90X meal plan and workout guide to a T you will see ridiculous results. The science of muscle confusion will take care of your strength, flexibility, and fitness. The meal plan will tell you what to eat to correctly fuel your body. The level of results is up to you. Want to look like Tony Horton and have ripped 6 pack abs? Then follow the whole plan. Do you already eat ok and are just looking to get in better shape? Then follow the workout guide. You’ll still achieve results that way but not as good as following the meal plan too. I never would have done Plyometrics, Kenpo, Yoga, and forget trying to do pull ups. However, I followed the tips Tony Horton would say to do in each workout to build up my strength. Turns out, he knows what he’s talking about. It was not that long after trying those exercises for the first time that I was able to get the form down and be able to do them. From there it was all about “Bringing It.” The meal plan taught me what to eat, when to eat it, and how to prepare it. I thought I ate well already but found out I could be eating much better. During each of the 4 rounds I’ve done of P90X I ate a little bit better and achieved my best P90X results yet. All you are trying to do is keep up with Tony Horton. No one is yelling at you. He cracks some jokes. You laugh (or not) and move on. What you will notice is there is somebody (male/female/young/old) like you working out on each P90X DVD. I like this as you can see the one person who is in ok, good, and great shape. What I did is pick the person who is in ok shape and try to keep up with them. Once I did that I would try to do as many reps as the person in good shape and keep moving from there. There is even a guy with a prostethic leg in the Plyometrics workout (its an hour of jumping). That should motivate you. This way you won’t feel like you’re failing because you can’t do 20 chin ups. All you do is keep up with the person using the resistance bands to mimic the pull up. I could never picture myself going to the gym to do Yoga as I thought I would look ridiculous there. Doing it at home with nobody watching was different. Nobody could make fun of me doing a “reverse warrior pose” at home. Forget going to the pull up bar at the gym. Jump up there, hang on, and drop off. I’d look like an idiot. At home I could grab a chair for balance and work my way up. I’d say over half of the things P90X makes you do I would never feel comfortable doing in the gym on my own. How much does your gym membership cost you a year? Mine was $720. The gym I went to was outstanding. It has everything. However, the $720 just gets me in the door. It does not teach me how to workout or what to do. That was up to me to figure out. If I wanted instruction then I would have to pay more for that. P90X cost me $120. I’ve used it almost daily since 2007 and am in way better shape now then I was for all of those years of going to the gym. I still get sore doing the workouts as I can now push myself harder. I’m not saying the gym is bad, but most normal people don’t get much out of it and that’s why gyms don’t work for most. Even when I take a break from P90X to focus on more sport specific workouts I always seem to incorporate P90X workouts. “Do your best and forget the rest” and “I presently struggle with” are two of my favorite quotes mentioned in P90X. I’ve taken those quotes and applied it to my every day life. When something new comes in front of me that I’m not good at I like to say those two quotes. I flashback to how I was stuck at doing zero wide grip pull ups for a long time and can now do 13. P90X is not a 90 day thing. Its how you will take care of yourself for the rest of your life. So there you have it. These are my top 10 reasons why P90X works. I’m sure there are other reasons but these are the ones that stick out in my mind since starting P90X in 2007. If you are thinking about buying P90X then just do it. The worst thing that will happen to you is you either take 3 months off from your current workout program and get in even better shape or you finally commit to taking care of yourself and get in shape. Sounds like a win win either way.